Tag Archive | "Drew Brandimore"
When our new administration began nearly three years ago, I was open to change and trusted our board of education to choose a new leader for our kids, teachers and staff of Cedar Springs Public Schools. Initially, I felt this change in leadership could take our district to a new level. Shortly after, however, I began to notice changes in how our staff members interacted with and presented themselves to others. Previously confident and comfortable, our educators were now apprehensive and spoke with reservation. Programs intended to better prepare our kids for their futures (such as 6th grade advanced math) have been discontinued and no one seems to have any answers about why that occurred. Field trips which served to spark curiosity and critical thinking skills have been eliminated in favor of more technology. Instead of learning being on the incline, it has been on the decline. Parent communication about the aforementioned changes has only come after inquiring, and in the administration’s efforts to “make it right” we are inundated with multiple emails from multiple sources all speaking about the same thing. Proactive communication has become reactive, and the staff I have spoken to feel they have been left to figure things out on their own with no support from administration. The positive change I was excited to see nearly three years ago is better described as a hot mess. In order to fix the communication problem and drive academics forward, collaboration is imperative. Last week 97 educators made an impassioned plea in favor of unity and showed us that collectively they feel Ted Sabinas and Mistie Bowser will help reunite and move this district forward. This expression of unity, unlike any we’ve seen in recent years, should serve as a wakeup call for anyone still undecided. I urge you to vote Ted and Mistie into the two open seats on our board of education, and let the healing begin. 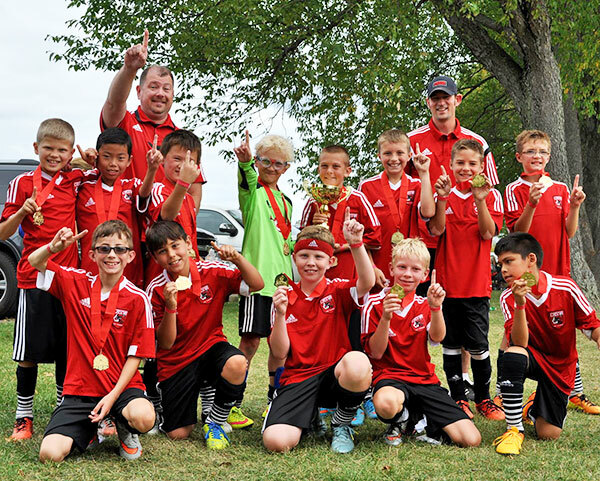 The CASSA U11 boys traveled to Kalamazoo to play in the Kingdom Cup tournament September 26-27, 2015. The boys started off the tournament with a tough loss to a very physical team from Hastings, Michigan, 0 to 3. As a coaching staff, we had concern this might set the tone for the balance of the tournament, but we remained optimistic and kept the team focused, as we prepared for our second game on Saturday. In the second game, we made some position changes and the boys stepped up to pull off a strong win over SCOR 5 to 1. That game changed the path of the tournament for us. We went into our third game with a can do attitude and we started to come together as a team. We won our third game with a score of 5 to 1 over Rapids FC. We came off that field with a renewed confidence in our ability to work hard and play a full game start to finish. Going into the championship game against the team we lost to in the first game, the boys had a determination to win and prove they are formidable competition. It was a very hard fought game but CASSA U11 Boys came out on top with a win over Hastings 2 to 1. They had come back to win the championship over the team we lost to first round. I must say that both Coach Boyer and I witnessed something special that day. We saw a group of kids come together through hard work, determination, and focus to win a game so they could walk off the field not as individuals but, as a TEAM. The growth we saw from this great group of kids this past weekend was amazing. They truly transformed themselves into a team. We as coaches are privileged to work with these boys and we look forward to their growth individually and as a team for the balance of our season.